This year I was diagnosed with coeliac disease. Aside from seeing the Free From aisle in my local Tesco and knowing that my aunt had it, my knowledge was pretty limited. When I was diagnosed, the doctors told me I would have to live on a strictly gluten free diet (no wheat, barley or rye) for the rest of my life, but to be honest, they told me very little else. I’ve always been a bit of an anxious traveller, but holidays are now an even more stressful affair. Are there any restaurants with gluten free options? Will I be sick on holiday? How many packets of gluten free biscuits can I fit in my suitcase? Will I starve for the next 7 nights? I love going away, and nothing will stop me from doing so, but preparation really is key. Some countries have amazing options, but others don’t take it seriously and you can be at risk from getting ill, (as I have) which is the last thing you want when you are on holiday. It is a waste of mojito drinking time. Packing lots of emergency food is essential to avoid being hangry on your holiday. This isn’t something I’m complaining about. I love a good supermarket trip. But now, it is more of an expedition. 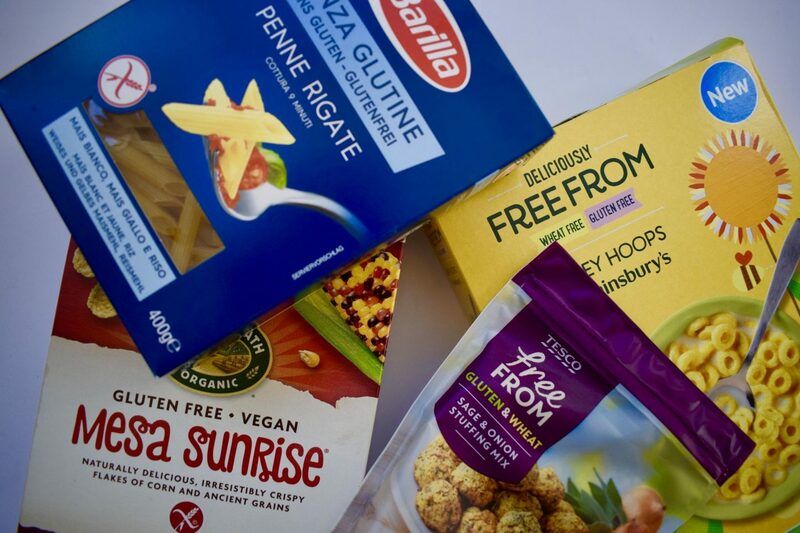 Hunting down foods which are naturally gluten free to avoid spending double the money, as well as snapping up any bargains, because who can afford to spend £3 on a loaf of bread? And the excitement you feel when you see that a supermarket has a huge free from aisle with loads of GF stuff you’ve never seen before… it’s like your birthday/Christmas have all come at once. Now don’t get me wrong, many people can suffer from eating gluten. Some people have a gluten intolerance, and can suffer with some of the same symptoms including bloating/IBS/sickness. For being personally, before being diagnosed, a lot of my main symptoms were less common ones. You can suffer from fatigue amongst many other things, so they are definitely not limited to only stomach problems. But then Brenda tells you that she knows exactly how you feel, because she gets bloated from eating a large Dominos pizza and a side of garlic bread, and you just want to shout “MAYBE JUST EAT LESS PIZZA THEN”, because that is NOT the same thing at all. Consuming a large amount of food will likely lead to bloating. Not the same as having an autoimmune disease Brenda. I am well ware that being gluten free now, is 3878954 times easier than it was 10 years ago. In fact it is getting better and better with more options becoming available as brands/restaurants are becoming more aware of the need for it. But when people who aren’t GF tell you it’s soooo easy to be gluten free while they eat their sandwich and you can’t even get a gluten free cookie because Starbucks have got it touching the regular ones, it can be pretty frustrating. Having a gluten free brownie every now and again doesn’t really give you the experience to say it’s easy. And don’t get me started on people who think that it’s just a trend being coeliac. Leopard print is a trend, intestinal damage is not. A common side effect of being gluten free, is that when you do accidentally ingest gluten, you can be far more sensitive to it. Cross contamination can leave you feeling ill for hours. Seems crazy that you were once able to eat wheat without having your day ruined. Not a fan of this. There is a huge misconception that going gluten free makes you healthy. Quite the contrary in fact, when people who don’t have coeliac disease decide to cut it out of their diet. I’ve seen several articles recently exposing the dangers of self-diagnosing and cutting out gluten without medical advice. You will lose key nutrients which help to keep your body running in tip top condition. I have to see a dietician and have regular blood tests amongst other tests, to ensure I can replace the food I’m missing out on to stay healthy. Aside from all this medical talk, if you have ever actually read the ingredients in gluten free alternatives, you will know that they are often packed with more sugar and a variety of E numbers so that they are vaguely edible and if you’re lucky maybe even a little enjoyable. Buy the regular doughnut if you have the choice. A doughnut isn’t going to be healthy either way. There is no better surprise when you realise that something delicious is in the regular aisle at the supermarket (and therefore also holds a regular price tag) and you look at the ingredients, expecting the word wheat to appear, but instead you are free to enjoy the food. Hallelujah!